We believe that the Agile values and practices apply to all parts of an organisation, not just the software development department. 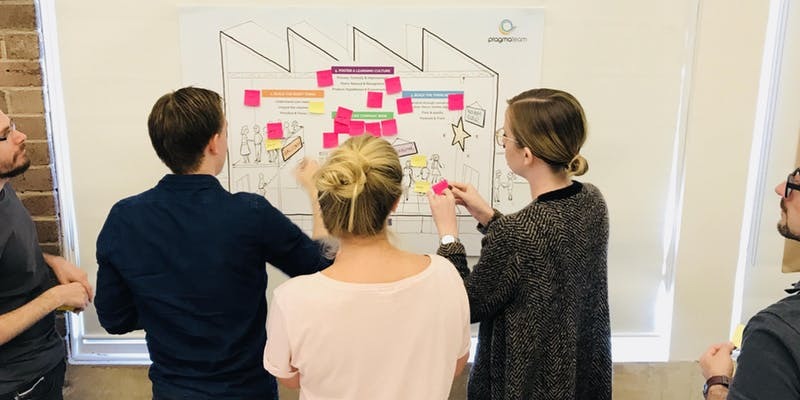 Our 1-day ‘Agile in Practice’ training will help you foster an Agile mindset and give you confidence in using tools and techniques to work more effectively with your team and advocate for Agile ways of working. Relevant. All our trainers are practitioners and work with delivery teams when they are not training. We bring the training to life with war stories and case studies. In the morning you’ll be introduced to the principles and practices of Agile. Over the day we’ll prepare you to work more effectively in an Agile environment, practising techniques and the mindset. We’ll simulate a real scenario, allowing you to experience an initiative discovery, followed by sprints working as a team. You will build a toolkit of techniques and behaviours needed to successfully transition your team to Agile ways of working. This training is one day and is limited to fifteen participants, enabling us to focus our attention on your specific questions. This is a very practical course and participants will build up their toolkit of tools and techniques to put into use the very next day. The training will run 9am to 5pm with short breaks for morning and afternoon tea. The exact location will be sent to you closer to the date.